Shimane Prefectur (島根県, Shimane-ken) is a prefectur o Japan locatit in the Chūgoku region on the main Honshu island. The caipital is Matsue. It is the seicont least populous prefectur in Japan, efter its eastren neighbor Tottori. The prefectur haes an aurie elongatit frae east tae wast facin the Chūgoku Muntain Range on the sooth side an tae the Sea o Japan on the north side. 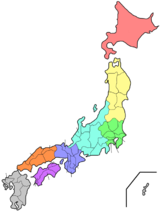 It is dividit intae the Izumo Region in the East, the Iwami Region in the Wast an the Oki Region, a smaa group o islands aff the northren coast. Maist o the ceeties are near the shoreline o the Sea o Japan. Izumo Taisha in Izumo Ceety is ane o the auldest Shinto shrines in Japan. 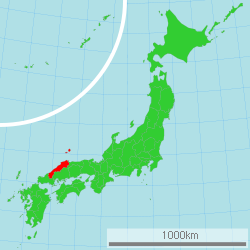 The Oki Islands in the Sea o Japan are an aa pairt o Shimane Prefectur, which an aa claims tae hae jurisdiction ower the Sooth Korea-controlled island o Liancourt Rocks (Takeshima).